The Old Town of Rhodes is one of the oldest inhabited medieval town in Europe. It was designated a World Heritage Site by UNESCO in 1988. The Order of St John of Jerusalem occupied Rhodes from 1309 to 1523 and set about transforming the city into a stronghold. They converted a palace originally built in the late 7th century as a Byzantine citadel into a fortress serving as their administrative center and the palace of their Grand Master. Near the old town is Mandraki Harbor is one of the three harbors in Rhodes. It is famous because it is believed that the great statue of Colossus, one of the Seven Wonders of the Ancient World, once stood at the harbor entrance (see here for a picture of how it might have looked like: http://www.telegraph.co.uk/news/worldnews/europe/greece/12067713/Colossus-of-Rhodes-one-of-the-seven-wonders-of-the-ancient-world-to-return.html ). Today there are deer sculptures at the entrance. Nearby is the St. Nicholas Fortress and a number of medieval windmills. This album contains some of my photos wandering around the area, only a 5-10 minute cab ride from the COUPLED 2017 venue. 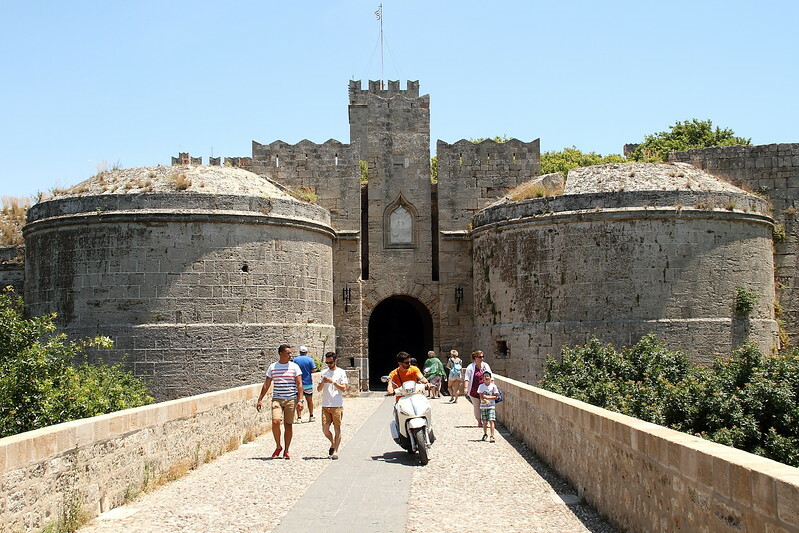 Entrance to Rhodes Old Town Medieval fortress.